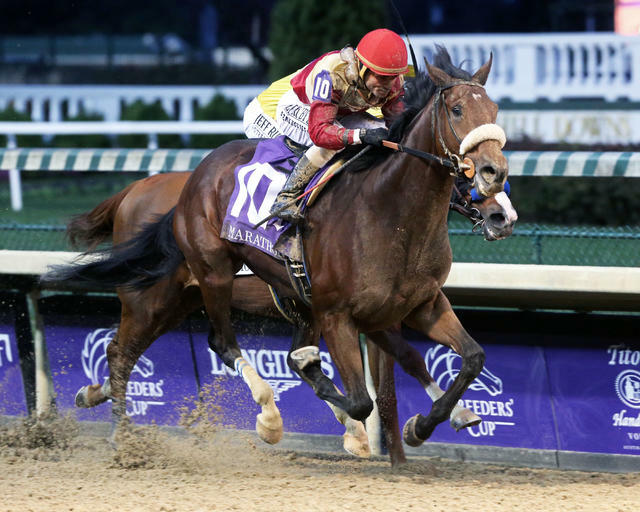 Centennial Farms’ Rocketry dug in late to pass pace-setting Dabster and win the $200,000 Marathon Stakes, the conclusion of Breeders’ Cup Friday at Churchill Downs. Trained by Jimmy Jerkens and ridden by Joel Rosario, Rocketry was relegated to last through the opening stages of the race while the Bob Baffert-trained Dabster led for 1 ½ miles under jockey Joe Talamo. Rocketry began his charge following Dabster’s one mile in 1:41.72 while rallying three wide on the final turn. Rocketry passed Dabster inside the eighth pole to win by a final margin of three-quarters of a length. Rocketry completed the 1 ¾-miles in 2:57.62 and returned $6.60, $3.80 and $3. Dabster returned $5.80 and $3.80 and Big Dollar Bill closed late for third and returned $3.20. Honorable Duty, who was sent off as the 4-1 third choice, was pulled up after 1 ½ miles by jockey Jose Ortiz. The Marathon Stakes was Rocketry’s fifth-career victory through 15 starts. The 4-year-old Hard Spun colt earned $120,280 for his win, which boosted his career earnings to $497,370. Toast of New York, Senior Investment, War Story, Term of Art and Finglas completed the order of finish. Breeders’ Cup Saturday gets underway at 10:45 a.m. (all times Eastern) beneath the historic Twin Spires. The Breeders’ Cup Classic (GI) has a post time of 5:44 p.m.
Chris Landeros, jockey of BIG DOLLAR BILL (third): “We were closing in late but just couldn’t catch the leaders. This horse is really nice and gives it his all every time he runs.